I travel a bit for work, and since most of my trips are 3-4 days long, I do a pretty good job packing EVERYTHING in my 18" rollerbag and a shoulder bag (i.e. I almost never check luggage). My shoulder bag in recent years, which counts as a "personal item" per U.S. airline regulations, was a conference bag made of ballistic nylon. It was pretty basic/ ugly, and the polyester straps were so uncomfortable, but the size and functionality were pretty solid. The zipper broke about a year ago, and instead of making a copy, I sewed a replacement bag from Simplicity 2350 / Cynthia Rowley. I'm pretty sure this pattern was not meant to make a critical piece of luggage for a frequent flyer, but that didn't stop me from wishing! Unfortunately, it started looking kind of sloppy after just a couple of trips. I used 1/2 yard 100% cotton canvas from IKEA (gifted from my good pal Stephanie) with some quilting fabric for lining and 100% cotton webbing for straps. I've been travelling with the bag for several months, making notes for the (hopefully) final travel bag in its next form. The quilting fabric lining is completely interfaced with a heavy interfacing, but it's still not very stiff. Maybe I will line with canvas next time, weight be darned. I also insisted on a top zipper, for when the bag tips over on the plane so my gum and impressive collection of pens doesn't spill all over the floor. The heavy metal zipper does pull the top of the bag inward, though, adding to its semi-disheveled appearance. Maybe a nylon zip next time? 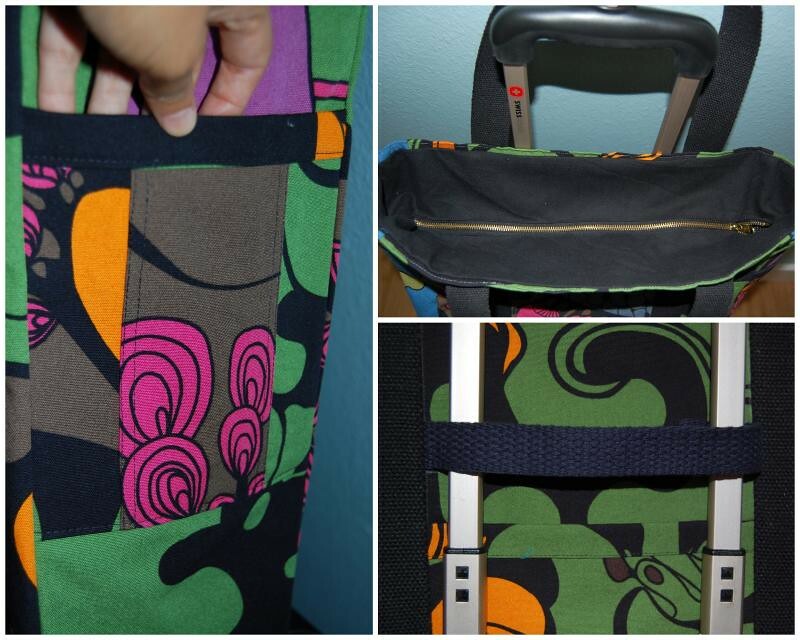 I love the custom pockets and the little strap to keep your bag on your carry-on! Love the idea...I need one of these! 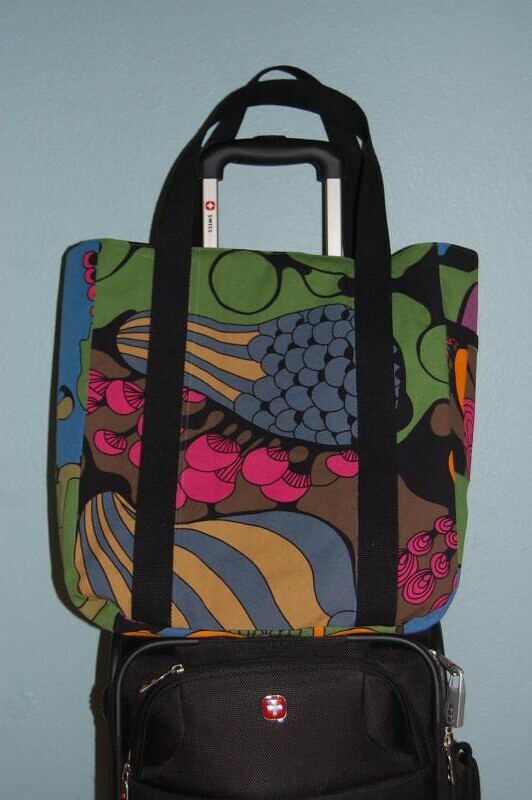 Of course I dont travel often, but its so hard to find cute AND functional travel bags. 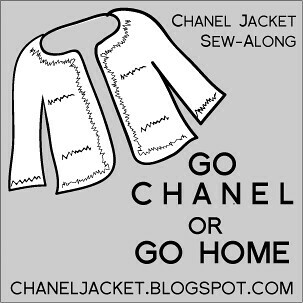 You found the fabric for your Chanel jacket??? Where??? what does it look like?? I remember you giving me a tour of your bag on the bus ride to NYC. Good times!! It's a hard road finding the perfect tote bag. They're either too big or too small or don't have enough pockets or too expensive. Welcome back. It's a clever bag clever girl! Did you buy the pull along or recycle it? Nice customizations! I always have trouble finding the right bag for travel or for everyday use - designers don't seem to think about function... I'll have to try this on my bag!